False advertising is the use of misleading, false, or unproven information to advertise products to consumers. One form of false advertising is to claim that a product has a health benefit or contains vitamins or minerals that it in fact does not. Many governments use regulations to control false advertising. A false advertisement can further be classified as deceptive if the advertiser deliberately misleads the consumer, as opposed to making an honest mistake. Often used in cosmetic and weight loss commercials. These adverts portray false and unobtainable results to the consumer and give a false impression of the product's true capabilities. If retouching is not discovered or fixed a company can be at a competitive advantage with consumers purchasing their seemingly more effective product, thus leaving competitors at a loss. Advertisers for weight loss products may also employ athletes who are recovering from injuries for "before and after" demonstrations. An ad may omit or skim over important information. The ad's claims may be technically true, but the ad does not include information that a reasonable person would consider relevant. For example, TV advertisements for prescription drugs may technically fulfil a regulatory requirement by displaying side-effects in a small font at the end of the ad, or have a "speed-talker" list them. This practice was prevalent in the United States in the recent past. Hidden fees can be a way for companies to trick the unwary consumer into paying excess fees (for example tax, shipping fees, insurance etc.) on a product that was advertised at a specific price as a way to increase profit without raising the price on the actual item. A common form of hidden fees and surcharges is “fine print” in advertising. Another way to hide fees that is commonly used is to not include “shipping fees” into the price of goods online. This makes an item look cheaper than it is once the shipping cost is added. Manipulation of measurement units and standards can be described as a seller deceiving customers by informing them with facts that either are not true or are using a standard or standards that wouldn’t be widely used or understood which results in the customer being misinformed or confused. Some products are sold with fillers, which increase the legal weight of the product with something that costs the producer very little compared to what the consumer thinks that he or she is buying. Food is an example of this, where meat is injected with broth or even brine (up to 15%), or TV dinners are filled with gravy or other sauce instead of meat. Malt and ham have been used as filler in peanut butter. There are also non-meat fillers which may look starchy in their makeup; they are high in carbohydrate and low in nutritional value. One example is known as a cereal binder and usually contains some combination of flours and oatmeal. Some products may have a large container where most of the space is empty, leading the consumer to believe that the total amount of food is greater than it actually is. The words “Diet, low fat, sugar-free, healthy and good for you” are labels they may see every day and they associate these labels with products that will aid a healthy lifestyle. It seems advertisers are aware of their needs to live longer and live well so they are adapting their products in accordance with this. It is suggested that food advertising influences consumer preferences and shopping habits. Therefore, by highlighting certain contents or ingredients is misleading consumers into thinking they are buying healthy when in fact they are not. Using a tick panel above the nutritional label and using large, bold font and brighter colours. Highlighting one healthy ingredient on the front of the packet with a big tick next to it. Using words like healthy and natural these are weasel claims – words that contradict the claims that may follow it. These are commonly used words where the meaning can be overlooked by consumers. Using words like ‘help’ on the products labelling, misleading consumers into thinking it ‘will’ help. However, this is not always the case. There has been an increase in the amount of large organisations going to court over misleading claims, stating that products are ‘school canteen approved’ or ‘all natural,’ hence claiming their products are healthy or only uses natural ingredients, but this is not always the case. Puffing is the act of exaggerating a products worth through the use of meaningless unsubstantiated terms, based on opinion rather than fact. Examples of this include many superlatives and statements such as “greatest of all time”, “best in town” and “out of this world” or a restaurant claiming it had "the world’s best tasting food". Typically puffing is not an illegal form of false advertising and can be looked at as a humorous way to grab and attract the attention of the consumer. Puffing may be able to be used as a defense against charges of deceptive advertising when it is formatted as an opinion rather than a fact. However, it can also be used as a defense for misleading or deceptive advertising. For example, claims like ‘Top Quality’ can have regulatory and legal consequences and can be looked at as illegal misrepresentation, if not supported through the products capabilities. 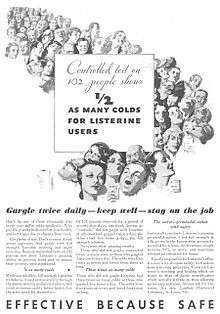 Listerine advertisement, 1932. The FTC found that the claim of these advertisements, reduced likelihood of catching cold, was false. Many terms have imprecise meanings. Depending on the jurisdiction, "organic" food may not have a clear legal definition, and "Light" food has been variously used to mean low in calories, sugars, carbohydrates, salt, texture, viscosity, or even light in color. Labels such as "all-natural" are frequently used but are essentially meaningless in a legal sense. Statements and terms like ‘recyclable,’ ‘biodegradable’ and ‘environmentally friendly’ need to be evaluated by reliable scientific evidence. Tobacco companies, for many years, used terms like "low tar", "light", "ultra-light" or "mild" in order to imply that products with such labels had less detrimental effects on health, but in recent years the United States banned manufacturers from labeling tobacco products with these terms. When the US United Egg Producers' used a "Animal Care Certified" logo on egg cartons, the Better Business Bureau argued that it misled consumers by conveying a higher sense of animal care than was actually the case. In 2010, Kellogg's popular Rice Krispies cereal claimed that the cereal can improve a child’s immunity. The company was forced to discontinue all advertising stating such claims. In 2015 the same company advertised their Kashi product as “all natural”, when it contained a variety of synthetic and artificial ingredients. Kashi paid $5 million to resolve the issue. "Better" means one item is superior to another in some way, while "best" means it is superior to all others in some way. However, advertisers frequently fail to list the way in each they are being compared (price, size, quality, etc.) and, in the case of "better", to what they are comparing (a competitor's product, an earlier version of their own product, or nothing at all). So, without defining how they are using the terms "better" or "best", the terms become meaningless. An ad which claims "Our cold medicine is better" could be just saying it is an improvement over taking nothing at all. Another often-seen example of this ploy is "better than the leading brand" often with some statistic attached, while the leading brand is often left undefined. In some advertised images of hamburgers, every ingredient is visible from the side shown in the advertisement, giving the impression that they are larger than they really are. Products which are sold unassembled or unfinished may also have a picture of the finished product, without a corresponding picture of what the customer is actually buying. Commercials for certain video games include trailers that are essentially CGI short-films - with graphics of a much higher caliber than the actual game. “The color of food packaging is considered to be extremely important in the marketing world” (Blackbird, Fox & Tornetta, 2013) as people see colour before they absorb anything else. Consumers buy items based on the colour they’ve seen it on the advertisement and they have a perception of what the packaging colours should also look like. However, when it comes to buying food, usually consumers can only judge the product based on the packaging and usually consumers judge products based on colour. When used to make people think food is riper, fresher, or otherwise healthier than it really is, food coloring can be a form of deception. When combined with added sugar or corn syrup, bright colors give the subconscious impression of healthy, ripe fruit, full of antioxidants and phytochemicals. One variation is packaging which obscures the true color of the foods contained within, such as red mesh bags containing yellow oranges or grapefruit, which then appear to be a ripe orange or red. Regularly stirring minced meat on sale at a deli can also make the meat on the surface stay red, causing it to appear fresh, while it would quickly oxidize and brown, showing its true age, if left unstirred. Some sodas are also sold in colored bottles, when the actual product is clear. Many products come with some form of the statement "chemical free!" or "no chemicals!". As everything on Earth, save a few elementary particles formed by radioactive decay or present in minute quantities from solar wind and sunlight, is made of chemicals. It is in-fact impossible to have a chemical-free product. The intention of this message is often to indicate the product contains no exceptionally harmful chemicals, but as the word chemical itself has a stigma, it is often used without clarification. Bait-and-switch is a deceptive form of advertising or marketing tactic generally used to lure in customers into the store. A company will advertise their product at a very cheap and enticing price which will attract the customers. Once they do, the store/company will then try to sell something that is more expensive and valuable than what they originally advertised. Regardless of the fact that only a small percentage of the shoppers will actually buy the more expensive product, the advertiser using the bait remains to gain profit. Bait advertising is also commonly used in other contexts. For example, in online job advertisements by deceiving the potential candidate about working conditions, pay, or different variables. Airlines may be guilty of "baiting" their potential clients with a bargains, then increase the cost or change the notice to be that of a considerably more costly flight. Reasonable timeframe, reasonable quantities - Businesses must supply publicized merchandise or services at the promoted cost for a sensible or expressed timeframe and in sensible or expressed amounts. There is no exact meaning of what is implied by a 'sensible timeframe' or 'sensible amounts'. Qualifying statements - General qualifying statements, for example, 'in store and online now' could at present still leave a business open to charges of bait advertising if sensible amounts of the publicized item are not accessible. Rain checks - When, through no shortcoming of its own, a business can't supply merchandise or services as promoted companies ought to have a framework set up to supply or acquire the supply of the merchandise or benefits at the promoted cost as quickly as time permits. Online claims - If a company is an online-based company, it is essential for them to keep everything on their website updated to avoid misleading customers. In some countries bait advertising can result in severe penalties. Similarly, a ‘free trial’ is an advertising manoeuvre to have consumers become hands-on with the products or services before purchase, without any money spent but a free trial in exchange for credit cards details cannot be stated as a free trial, as there is a component of expenditure. This refers to a contract or agreement where no response is interpreted as a positive response in favor of the business. An example of this is where a customer must explicitly "opt-out" of a particular feature or service, or be charged for that feature or service. Another example is where a subscription automatically renews unless the customer explicitly requests it to stop. In the United States, the federal government regulates advertising through the Federal Trade Commission (FTC), and additionally enables private litigation through various statutes, most significantly the Lanham Act (trademark and unfair competition). In 2013 and 2014, the United States Supreme Court reviewed two false advertising cases: Static Control v. Lexmark (who has standing to sue under the Lanham Act for false advertising) and POM Wonderful LLC v. Coca-Cola Co..
State governments have a variety of unfair competition laws, which regulate false advertising, trademarks, and related issues. Many are very similar to that of the FTC, and in many cases copied so closely that they are known as "Little FTC Acts." In California, one such statute is the Unfair Competition Law (UCL). The UCL “borrows heavily from section 5 of the Federal Trade Commission Act” but has developed its own body of case law. These factors of deceptive advertising are critically analysed as they may crucially impair a consumer's ability to make an informed decision, thereby limiting their freedom of choice. This system resembles American practice as reflected by the FTC in terms of disallowing false and deceptive messaging, prohibition of unfair and unethical commercial practices and omitting important information, but it differs in monitoring aggressive sales practices (regulation seven) which included high-pressure sales practices that go beyond persuasion. Harassment and coercion are not defined but rather interpreted as any undue physical and psychological pressure (in advertising). Even if proven cases of false advertising do not inevitably result in civil or criminal repercussions: the Office of Fair Trading states in the instance of false advertising, companies are not always faced with civil and criminal repercussions, it is based on the seriousness of the infringement and each case is analysed individually, allowing the standards authority to promote compliance with regards to their enforcement policies, priorities and available resources. Another area of departure from American practice relates to a general prohibition on the use of competitors' logotypes, trademarks or similar copy to that used in a competitor's own advertising by another, particularly when making a comparison. In Scotland, offences are evaluated by. and potentially prosecuted through, the Crown Office and the Procurator Fiscal Service on behalf of the Lord Advocate. In Australia, Australian Competition and Consumer Commission also known as the ACCC, are responsible for ensuring all businesses and consumers act in accordance with the Australian Competition & Consumer Act 2010, as well as, fair trade and consumer protection laws (ACCC, 2016). Each state and territory have its own consumer protection agency or consumer affairs agency (ACCC 2016). The ACCC is designed to assist both consumers, businesses, industries and infrastructure within the country. The ACCC assists the consumer by making available the rights, regulations, obligations and procedures; for refund and return, complaints, faulty products and guarantees of products and services. They also assist businesses and industries by developing clear laws and guidelines in relation to unfair practices and misleading or deceptive conduct. There are many similarities in the laws and regulation between the Australian ACCC, the New Zealand FTA, the American FCT and United Kingdom CPR. The structure of these policies is to support fair trade and competition alongside offering the consumers exactly what they are selling, in order to reduce deceptive and false practices. However, it is not limited to these countries, as most countries have agreements with the International Consumer Protection and Enforcement Network or ICPEN. In New Zealand, the Fair Trading Act 1986 aims to promote fair competition and trading in the country. The act prohibits certain conduct in trade, provides for the disclosure of information available to the consumer relating to the supply of goods and services and promotes product safety. Although the Act does not require businesses to provide all information to consumers in every circumstances, businesses are obliged to ensure the information they do provide is accurate, and important information is not kept from consumers. A range of selling methods that intend to mislead the consumer are illegal under the Fair Trading Act: The Act also applies to certain activities whether or not the parties are 'in trade' – such as employment advertising, pyramid selling, and the supply of products covered by product safety and consumer information standards. Both consumers and businesses alike can rely on and take their own legal action under the Act. Consumers may contact the trader and utilize their rights which have been stated in the Act to make headway with the trader. If the issues are not resolved, the consumer or anyone else can take actions under the Act. The Commerce Commission is also empowered to take enforcement action and will do so when allegations are sufficiently serious to meet its enforcement criteria. ↑ "Deceptive Advertising Definition - Consumer | Laws.com". consumer.laws.com. Retrieved 2016-04-03. ↑ "Ribena-maker fined $217,500 for misleading vitamin C ads". New Zealand Herald. 2007-03-27. ISSN 1170-0777. Retrieved 2016-04-03. ↑ "Airbrushed make-up ads banned for 'misleading'". BBC News. 2011. ↑ "Illegal Price Advertising". Boundless.com. 2015-07-21. Retrieved 2016-03-31. ↑ "Surcharges And Hidden Fees - Fraud | Laws.com". Fraud.laws.com. Retrieved 2016-03-31. ↑ "Add-ons and hidden fees | Commerce Commission". Comcom.govt.nz. Retrieved 2016-03-31. ↑ "Scams, cons and the TRUE cost of your budget flight: How our dreams of a bargain holiday are spoiled by unsavoury added extras". ↑ Wallechinsky, David (1975). The People's Almanac. Garden City: Doubleday. p. 1010. ISBN 0-385-04060-1. ↑ "O.C. DA's lawsuit may force Axe hair products to redesign containers". ↑ "Giving false information or omitting relevant information in the application". Victoria Legal Aid. 2014. ↑ Jolly, R (2011). "Marketing obesity? Junk food, advertising and kids". Parliament of Australia. 1 2 3 4 Jones, S., (2014). "Fat free and 100% natural: seven food labelling tricks exposed". The Conversation. ↑ Watson, E., (2014). "Heinz is latest target in new wave of false advertising lawsuits over 'all natural' claims and GMOs". Food Navigator-USA. com. ↑ Lannin, S., (2016). "Consumer watchdog fines junk food giants over misleading 'healthy' kids food". ABC NEWS. ↑ Calderwood, James (1998). "False & deceptive advertising". Ceramic Industry. 1 2 Hsieh Hsu Fang, Ching-Sheng Ya-Hui Wen-Chang (2010). "The Relationship Between Deceptive Claims and Ad Effect: The Moderating Role of Humorous Ads". International Journal of Business and Information. ↑ Chandran, Ravi (2004). "CONSUMER PROTECTION (FAIR TRADING) ACT". Singapore Journal of Legal Studies. 1 2 Lysonski Duffy, Steven Michael F (1992). "The New Zealand Fair Trading ACt of 1986: Deceptive Advertising". The Journal of Consumer Affairs. ↑ Toncar Fetscherin, Mark Marc (2012). "A study of visual puffery in fragrance advertising". European Journal of Marketing. ↑ U.S. Food and Drug Administration (22 June 2010). "Light, Low, Mild or Similar Descriptors". Retrieved 16 September 2014. ↑ Barrionuevo, Alexei (2005-10-04). "Egg Producers Relent on Industry Seal". The New York Times. Retrieved 2010-03-27. ↑ "Kellogg settles Rice Krispies false ad case". Retrieved 2016-04-01. ↑ "Suit Prompts Kellogg's to Drop "Natural" Labels on Kashi Products". NBC. Retrieved 2016-07-25. ↑ "Bait And Switch Definition". Investopedia. 2014-04-11. Retrieved 2016-03-31. ↑ "Bait Advertising - Department of the Attorney-General and Justice - NT Consumer Affairs". Consumeraffairs.nt.gov.au. 2016-01-06. Retrieved 2016-03-31. ↑ "Bait advertising | Commerce Commission". Comcom.govt.nz. Retrieved 2016-03-31. ↑ "Misleading and Deceptive Conduct: Bait Advertising" (PDF). Journal.mtansw.com.au. Retrieved 2016-03-31. ↑ "Restatement (Second) of Contracts §33". Lexinter.net. Retrieved June 2, 2012. ↑ "California Civil Code - CIV § 1770 - FindLaw". Findlaw. 1 2 "Advertising and selling guide". Australian Competition & Consumer Commission. October 24, 2016. ↑ "Fair Trading". ACC Government Access Canberra. October 25, 2016. ↑ "Fair Trading NSW". NSW government Fair Trading. October 25, 2016. ↑ "Fair Trading". Queensland Government. October 25, 2016. ↑ "Consumer and business services". Consumer and business services South Australia. October 25, 2016. ↑ "Consumer Affairs and Fair Trading". Tasmanian Government. October 25, 2016. ↑ "Consumer Affairs Victoria". Consumer Affairs Victoria. October 25, 2016. ↑ "Depatment of commerce". Government of Western Australia. October 25, 2016. ↑ "International Consumer Protection and Enforcement Network". ICPEN. October 24, 2016. 1 2 3 "What is the Fair Trading Act ... | Commerce Commission". www.comcom.govt.nz. Retrieved 2016-04-01. 1 2 "About us | Commerce Commission". www.comcom.govt.nz. Retrieved 2016-04-01. 1 2 3 "Fair trading act". Consumer NZ. Retrieved 2016-04-01.
International Chamber of Commerce, Consolidated ICC Code of Advertising and Marketing Communication Practice, 2011.